Change is in the air. Ever since the Blackwing pencil was revived in 2010, Blackwing introduced new pencils and tuned their existing pencils as the Blackwing brand has evolved. 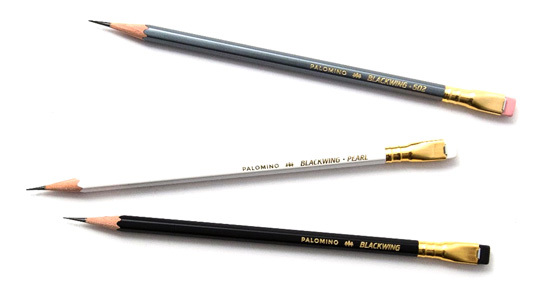 Now, Blackwing has announced design updates to the three core Blackwing pencils that continue this tradition. These changes bring some consistency to the pencils and address feedback requests from Blackwing fans. What’s different: Pink eraser instead of black. From its introduction in the 1930s to its disappearance in the 1990s, the Blackwing 602 sported a pink eraser. Now the classic look is back. Blackwing 602 pencils will now come loaded with the traditional pink eraser. If you prefer the black eraser, we’ll still be offering black replacement erasers on our website. What’s different: Gold imprint instead of black, white eraser instead of black. The black imprint didn’t seem to speak to essence of the Blackwing Pearl or align with the gold imprint on other pencils, so Blackwing took the pencil back to the drawing board. Blackwing Pearl pencils now feature a gold imprint and white eraser. If you prefer the black eraser, we still offer black replacement erasers on our website. What’s different: Black eraser instead of white. The Blackwing received the subtlest of updates. Blackwing pencils will now come loaded with a black eraser, giving them a simple and sleek black on black look. If you prefer the white eraser, we’ll still be offering white replacement erasers on our website.